I think it is great that people work really hard, using creative and new ideas, to help to try to get through to disaffected youths. In our society, we need more people like that. And I think it is totally cool that those who do this are honored for their efforts, and that tributes are paid to them. Take the Lead is just such a tribute, and just a little bit more. 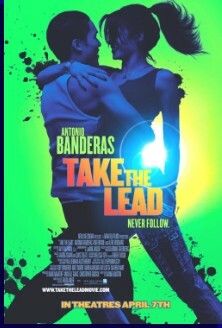 Inspired by a true story, Take the Lead stars Antonio Banderas as internationally acclaimed ballroom dancer Pierre Dulane. The film revolves around a professional dancer who volunteers to teach in the New York City public school system. But when his classic methods clash with his students’ hip hop instincts, he teams up with them to create a new style of dance and becomes their mentor in the process. Look, as a film critic, I am required to point out the following significant flaws in this movie: 1) Take the Lead is a movie that has been made before. It is entirely derivative. Think Coach Carter meets Fame. Think Dangerous Minds or Lean on Me meets Dancing with the Stars. 2) Nearly all the characters in the movie are stereotypes, straight out of the mold of these types of films. None of the characters “break out” or otherwise distinguish themselves as being different in any way. 3) The premise behind the movie (that a group of kids could learn to dance at a competitive level in just a semester’s worth of detention periods) is ridiculous. But with those realities in mind, it must be acknowledged that this movie is terrific fun to watch. The characters, while stereotypical, are compelling and interesting, and the film does a good job of cluing us in on who to root for and who to root against. Antonio Banderas is much better in this role than he was in Zorro, for example, and you could really feel the estrogen pumping through the theater during his dance scenes. Take the Lead is what it was intended to be. It’s not great, and it’s not ground-breaking. But this movie worked. Armstead’s Second: So I’m watching Yaya DaCosta, who plays the character Lahrette in this flick and I’m thinking ‘Damn she’s fine.’ Then a wave of guilt washes over me because she’s like, in high school or something thus making me almost old enough to be her dad. Then I remembered that Luke Perry was close to fifty when he was supposed to be in high school on ‘Beverly Hills 90201’. I look her up on the IMDB and relief! She’s twenty-three. Too old to be my daughter. Realistically at least. Damn she’s fine. I wonder if she has a man? Oh yeah, about the movie… What Bud said. Hmmm. I wonder what she’s wearing right now?